On the right we have a 24 hour height tendency off the European model from Penn State E-Wall. In a typical pattern we have a ridge, trough, ridge, trough and so on. However, vorticity (a measure of spin) from Ana is noted in the model and can be seen as the small "kinks" in the area circled. 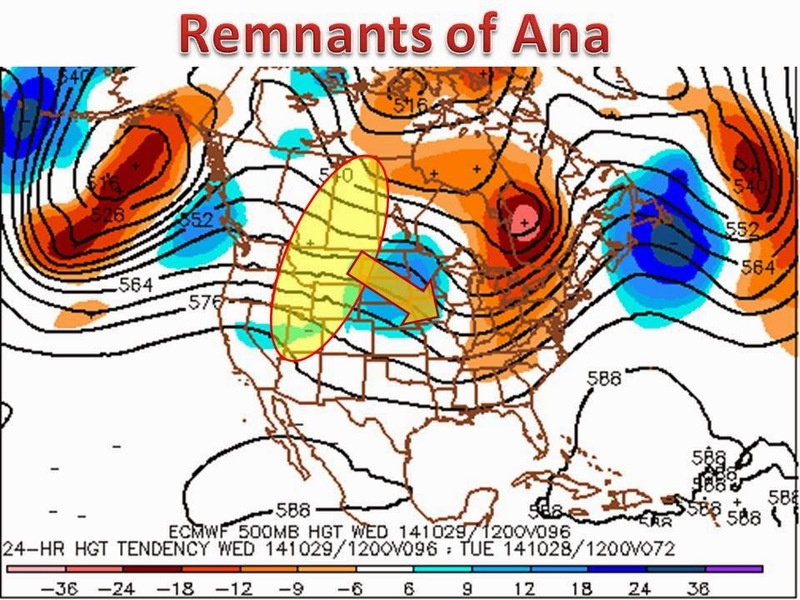 While Ana will not have a noticeable effect on weather over Montana and points south, it will affect the pattern at upper levels for the eastern half of the country, which will have an effect on temperatures across the region by the end of the week. While models were showing a large ridge over the eastern half of the country the past few days by the end of the week, a complete opposite is now the norm in the models. The GFS and EURO are lagging behind with the unusual influence of Ana in Pacific Ocean. The GFS and EURO are both showing this profound trough over the Midwest and points east by Halloween. The trough will allow the significant surge of colder Canadian air to filter in. Imagine pushing down on a pool of water and building your own "trough," the discontinuity made will fill in with an attempt to reach a balance. Here are the 850mb temperatures off the GFS (left) and European (right) computer models. The robust GFS has temperatures of 10-14C below zero over the Great Lakes, which translates to high temperatures in the 30s. The Euro has highs in the 40s and 50s for the same region. 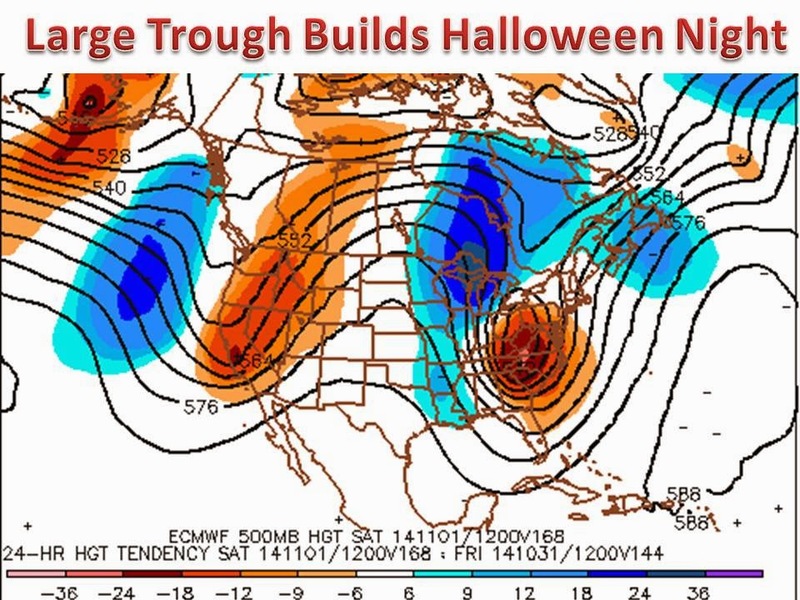 No matter what model proves to be fully accurate, a below normal Halloween should be expected. I would expect the Official CPC 6-10 Day Outlook to be updated in the coming days to reflect this shot of colder air.